On 30 March, I’ll be performing live at Flatpack Festival, Birmingham, in one of a series of events celebrating the heyday of Birmingham Arts Lab. Here’s Alan Moore on arts labs in the 60s and 70s. With its lack of hierarchy, its collaborative working and an atmosphere which encouraged wild creativity, the arts lab scene has strong affinities with hacking and making culture today. My performance is one of a series curated by Vivid Projects. I’ll be playing live on theremin, laptop and other electronics, accompanied by my robots – details coming soon. 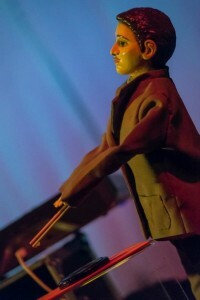 In the meantime, here’s a photo of one of my latest works: Wolfgang, a Kling Klang-inspired robot drummer. Wolfgang had his debut performance earlier this month at Spirit of Gravity, Brighton, and is one of the machines joining me on stage at Flatpack.